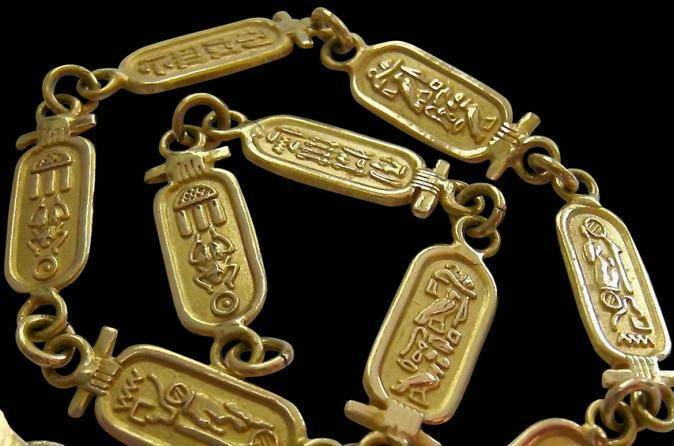 Explore the true Egyptian art and have it to your front eye as during the Cartouches Manufacturing will help you to see the best Egyptian Cartouche Jewelry, Personalized Silver Cartouches and solid 18K Gold, Cartouches. Each Cartouche from Egypt is handcarved and crafted to order by skilled Egyptian cartouche artisans. A Cartouche was a loop of rope with a knot at one end. The cartouche was thought to represent the universe. The custom of writing the Pharaoh's name inside the Cartouches represented his rule over the universe. A cartouche is an oval frame which surrounds the hieroglyphs that make up the name of an Egyptian God or royal person. The above example is based on the cartouche of Tutankhamun.It represents a looped rope which has the magical power to protect the name that is written inside it.A cartouche was meant to protect against evil spirits both in this life and the afterlife.It can be arranged both horizontally or vertically depending on the best layout for its design.